Its 6 days into the new year already. Ive done quite a few things but not all have photos. 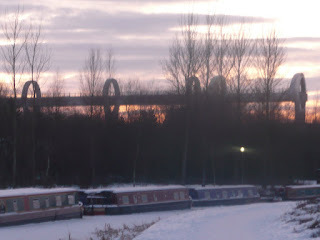 The photos on this post are from a walk I took along the canal near to my home. The top image is of me and MacDuff walking along the canal path. 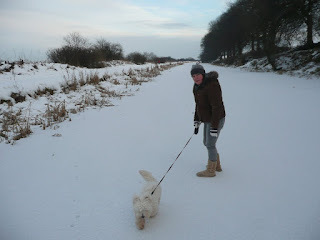 This photo is me walking actually on the forth and clyde canal, it was frozen solid. 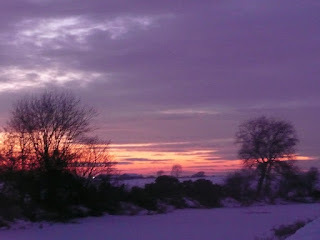 This image was taken on the walk home from my daughters flat, where we stopped off for a little while. It was nice to see my daughter and grandson. I really dont stop in at her flat often enough. This is something I will try to rectify this year. The structure you can see just in the background behind those trees is Falkirk Wheel which joins the forth and clyde canal with the union canal. Enough ramblings for today I think I will come back soon and post again, another of my promises to do things I want to do :) This will be fun to look back on and see what Ive been up to and how Ive changed. Some wonderful pics there! I need to brave the snow and get some teabags and food! And well done on starting the New Year as you mean to go on! 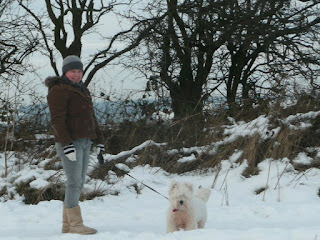 Beautiful pictures, Tania, glad you are enjoying the snow with McDuff, my dog always loved snow. Have a good year! gorgeous photos tan, and well done with a plan for this year. i really hope you can do them all and more.